„The objective of the course was to introduce participants to the theory and training necessary to manage geodata and geomodels with GST and advanced functions of gOcad®. The course was conducted by TU Bergakademie (TU BAF), Freiberg and ENSG, Nancy. It was attended by 12 participants from 8 different countries, including 9 ProMiners. 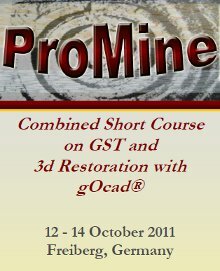 The training itself was split into 2 parts: (i) lectures on the data model and a training course on how to use the GST database system developed by TU BAF for 3D geodata and geomodels (1 day and half); (ii) a training course on restoration techniques developed in the gOcad software including Kine3D surface restoration kit and restoration implicit model plug-ins developed by the gOcad research group of Nancy-University (1 day and half).